Construction - How is Walter built? Trajectory - How does Walter move? Kinematics - How are angles computed? Webserver - Where are trajectories executed? Cortex - How are motors controlled? Bill of Material - What is Walter made of? 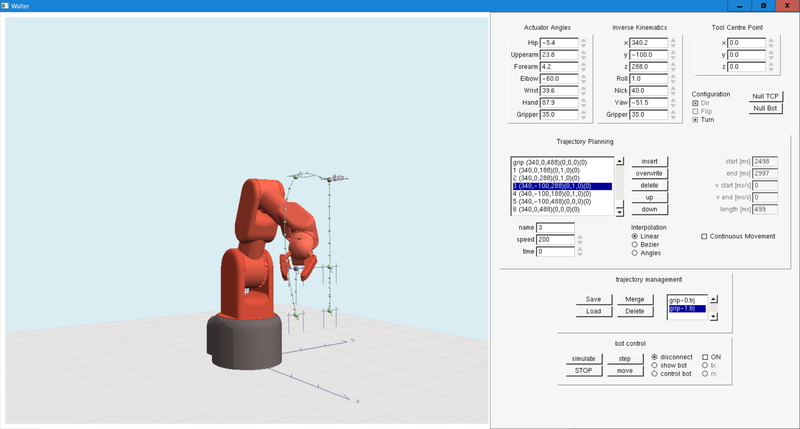 Sources - C++ Code, CAD models, FAQ, etc. Planning a trajectory means defining a sequence of poses in 3D space. These defined poses are interpolated in order to result in a smooth and continuous curve. Most beautiful are cubic Bézier curves. The picture illustrates a trajectory defined by A, B, C, and D. We want to model the piece between B and C with a cubic Bézier curve. 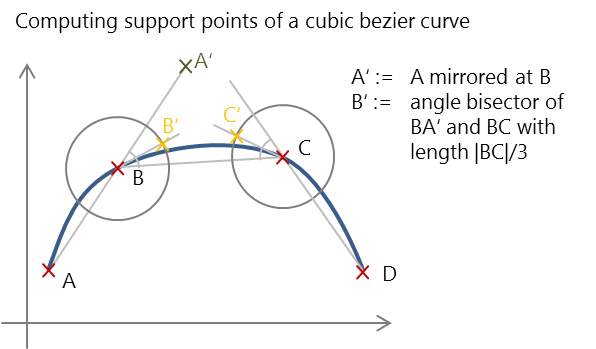 The support point B’ is computed by taking point A, mirroring it at B (A’), and moving along the angle bisector of A’ B C by a 1/3 of the length of BC, C’ is computed in an analogous manner. This approach is rather arbitrary, but results in a smooth and non-oscillating curve. On the left, we see a linear trajectory, on the right the same curve as bezier curve. 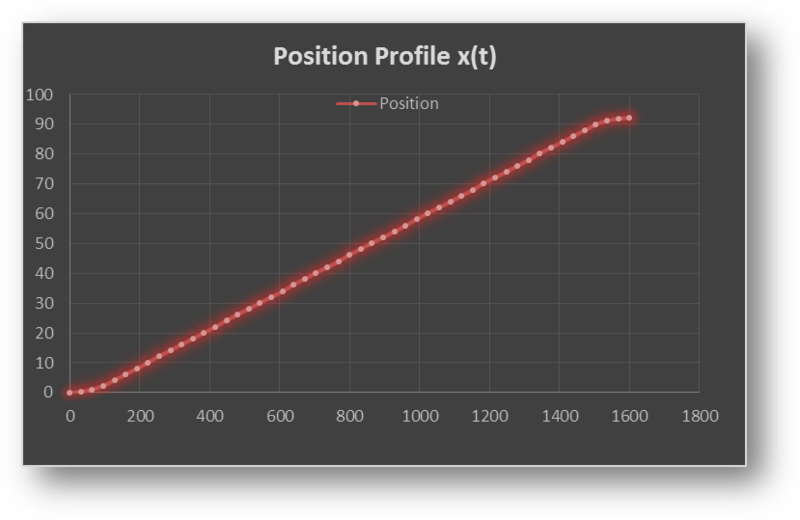 All this is implemented in BezierCurve.cpp. With the equation above on computing d we get tg. This holds true for a trapezoid profile only, since to model a full trajectory that consist of single movements we also need profiles that represent a ramp or stairways, depending on the constrains in terms of duration, distance, and start/end speed. This ended up in quite a lot of code treating all the different cases. On the right, the effect of a speed profile is illustrated compared to the same trajectory without speed profile. The effect is not spectacular, but can be detected when watching the top left and bottom left corner: On the left, the movement is continous. 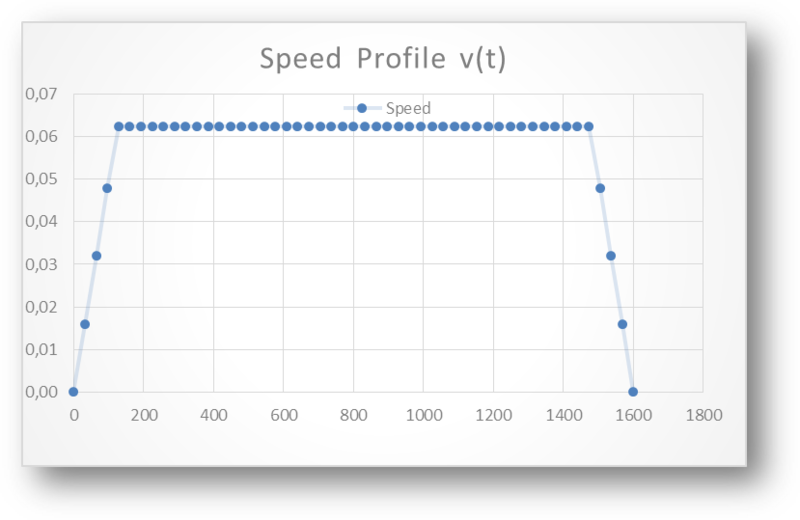 On the right, the movement stops slowly and accelerates when it continues.Speed profiles are implemented in SpeedProfile.cpp. This UI provides forward and inverse kinematics (explained in Kinematics), allows to define a trajectory by defining support points (indicated by big green balls). After having assigned some parameters like speed or duration the trajectory is compiled, i.e. the bezier curves and speed profiles are computed (indicated by small green balls). This trajectory can be send to Walter to be executed by its Cortex. Now we have a nice trajectory with a smooth speed profile, but do not yet know how to compute the angles of the joints. This is explained in Kinematics and will be tough to read, take your time.